Diana Hand, Marketing Manager at GuideStar, talks about how Marketing Mojo assisted her nonprofit with its Google Grant and pay-per-click advertising campaign. GuideStar, a nonprofit organization located in Washington, D.C., needed to meet the requirements necessary to achieve the next level of funding through the Google Grants program, increasing their pay-per-click (PPC) budget to $40,000 per month. Marketing Mojo started working with GuideStar and their Google Grant account through our PPC advertising service, focusing on expanding their AdWords account, and helping them meet requirements set by the Google Grants program, all while working to improve conversion performance. After just a few months of partnering with Marketing Mojo, GuideStar met the requirements needed to apply for the Google Grantspro status, increasing their free ad dollars from $10,000 per month to $40,000 per month. 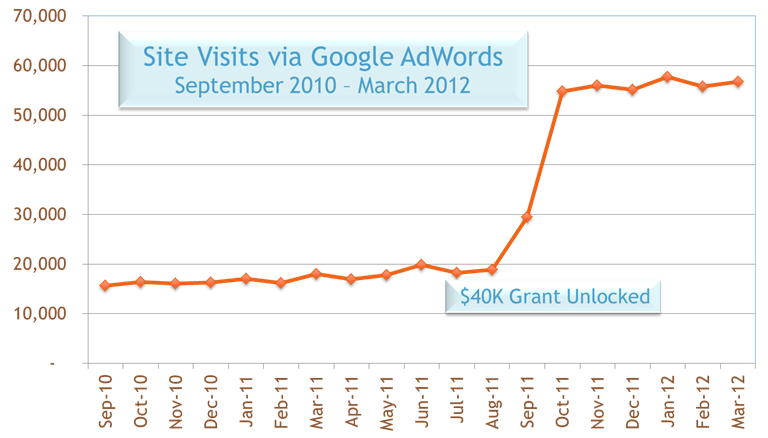 After GuideStar received notification of their new grant status, visits to their site from paid search increased within the month from about 20,000 to close to 60,000 visits.